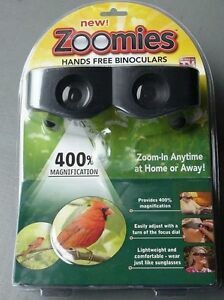 Details about Zoomies Hands Free Binoculars 400% Magnification ~AS SEEN ON TV~ FREE SHIPPING! Zoomies are good, light weight binoculars easy for me to use. Good for hands-free binoculars. However, I had ordered them for my husband that has a stroke and having trouble with his eyesight. I would not recommend them for someone in this situation. Still glad I have them on hand if I ever need them. I bought these for a friend who is going blind just to see if they might help. Bottom line, some. She says she can see the 55" big screen better though she sits 7 or 8 feet away. She also reports being able to see highway signs better as she rides down the highway. Don't freak out, she doesn't drive! Her 85 year old mother likes them as well for watching TV. They take some getting use to seeing some one wearing these goofy looking specs but if they help some one just a little, they're certainly worth the money. The lenses are plastic and would need to be protected and cleaned very gently. As for me, they are not of much value as I'd p/u my good binoculars to have a look see of something up close. not what it's cracked up to be. there is no adjustment for for centering the lenses on your eyes. it does not get very clear a 200 yards to see golf ball on the green. if one of my eyes is different than the other --there is no adjustment either. i wasted my money! These broke as soon as I tried to adjust them. Very cheaply made product. I really expected these to work at least a little and break within minutes of opening the package.